When many people purchase a new house there are always things you didn’t notice on the last inspection or didn’t even think about needing. To help you out please find a list of the top items you could use for a new house below. These items also make great gifts for someone you now has just bought as house. Duct tape – Useful for sealing any gaps or holes quickly. Bungee cords – Great for moving the Christmas tree along with anything else you need to bundle to your car. A tarp – Helpful for yard work, useful in case your grill cover blows away, can help cover a broken screen, and can even be used as a drop cloth while painting. Have a broken screen panel on your screened in porch from the same storm? Hang that tarp. Need a drop cloth while you paint your kitchen? You get yourself a tarp. Need to catch branches on the ground while your prune your trees? Get a bucket. Flashlight with extra batteries – In case of a power outage or other emergency. Fire extinguisher – One for each floor, along with one in the kitchen and garage. Studfinder – Great tool for fining the right place to hang anything you need. Toilet plunger – Better to be ready for what might happen and not be s… out of luck. Long high quality extension cord – You never know when the power might go out in a room or area and how far away that place might be. High quality hose – You will need it for a long time so make sure it lasts and doesn’t leak. Tool set – Start with a cheap one but as tools break from use understand which one’s are used the most off and slowly replace them with the best quality one’s you can afford. Carpet cleaning machine – Spring the couple hundred dollars and keep your house clean. Ladder – Useful for changing light bulbs, cleaning gutters, and anything else you can’t reach on your own. Carbon monoxide detector – Better to be safe than sorry. Level – A very helpful tool to check if pictures you are hanging are flat or any other project you are working on. Voltage pen – To easily make sure the various outlets are wired well and won’t zap you or your appliances. Dolly – To move heavy items around easily. Make sure the house receives cellular signal and if it doesn’t look into getting a signal boosting device or make sure you are utilizing Wifi when calling. Cash – You will never know when the pipe will leak or what other small issues will come up. Why Should Not I Pay Off My Home Loan? No one needs to pay a home loan any more extended than would normally be appropriate. It’s a bit unsettling to have a tremendous obligation approaching over you for a considerable length of time, piling on intrigue. You may even be enticed to pay off your home loan early in case you’re sufficiently blessed to have the money lying around. In any case, paying off a home loan early isn’t generally the most intelligent choice, and there’s a reason home loans are alluded to as “great obligation.” So in case you’re considering paying off your home loan ahead of schedule, here are three motivations to re-examine. Paying all that home loan intrigue has an advantage, and it comes as a conceivably sizable assessment derivation. In case you’re in a high assessment section, missing out on this finding could mean paying more in duties, particularly if doing without it pushes you into the following higher section. The lodging business sector isn’t especially fluid. Purchasing and offering property takes a great deal of time and work; wrapping everything up can take weeks or even months. On the off chance that you utilize your discretionary cash flow to pay off your home loan, making your home your lone real resource, then you’ll experience issues covering any enormous costs that may emerge. In the event that you lose your employment, have a medicinal crisis, get hitched, or send a child to school, for instance, you’ll need to have fluid resources available. Moving house ought not to be your exclusive choice. Then again, in the event that you take the cash you’d use to pay off your home loan and rather spread it out over a differing arrangement of speculations, including stocks and bonds, then you’ll have more choices ought to the requirement for money emerge. When you put your cash in stocks and bonds, you can possibly secure a salary stream through profits, premium instalments, and capital increases. Paying off your home loan, notwithstanding, won’t give you salary. Rather, it will abandon you with constrained money left over to contribute. In the event that you put all your cash into your home, it could take years for it to develop in esteem, and paying off your home loan could restrain your capacity to produce wage for things like school, retirement, or other short-and long haul objectives. In the event that your home loan conveys a high financing cost and you have the money close by to pay it off, then you should pull out all the stops. However, in the event that you have a low loan fee, you can exploit it by clinging to that home loan and utilizing your money to create higher returns somewhere else. So in totality one can say very easily that its beneficial sometimes not to pay home loans as it saves you a lot of tax and can help in negotiating salary. One should paying off home loans in such a way that one can easily turn the liability into asset. Are you working more than 80 hours a week? Is over time working leading to happiness? Are you able to balance your life? Working significantly overtime does not always mean more earning or more happiness. Many end up working overtime because of the greed of earning more. Stop for a minute and analyses, are working overtime consistently landing to increase in happiness quotient? Badly defined job role: Maybe you have accepted a job that is poorly structured, which doesn’t have clear job boundaries. So many times, you end up doing every one job. Your skill and Job description doesn’t match: Have you ended up being in the wrong job? One of another major reason anyone spends loads of overtime because the lack of skill to job smartly. Bad time management: Another reason in this connected world is bad time management, at the office do office work, at home be at home. If you are consistently doing overtime may check your time priorities and allocation. Maybe you are not able to finish job within allocated time due to multi-tasking like doing online shopping, Facebook during work which is breaking your theme of work and every time you break your flow you need to restart to gain speed. You are “YES” person: Saying NO is an art. Don’t accept jobs if you are already loaded with work and if you think. It is right to say No with right reason. Otherwise, you end up accepting everything and spending overtime consistently at work. However, stating all the above, there are some cases where you are working overtime for the period, which does not qualify for consistently working overtime. For example, a lot of accounting jobs need to put extra hours during financial year ends due to business needs and the way business conducted. That is not because of your time management or lack of skill. This kind of overtime happens for short period with correct business reason. Another such example you are working on your start-up project, where you end up spending loads of time until your idea becomes reality. This is a clear example of passion driving overtime. However, be aware you are a human being you get stressed, you need to revitalize for better thinking and being ultra-productive. So Working significant overtime consistently surely leads to stress, fatigue making you less productive and innovative. This creates a loop of overtime and stress. Get out of it. Get refreshed, do what makes you happy, spend time on health. A good mind can do wonders in minutes. Be active and alive. Check out the below list of the 46 best ways to save money. 1. Open a saving account and actually save money in it. Start small just $20 a month but slowly up that to $100 a month to make a nice rainy day fund. 2. Don’t waste money on things you don’t need. Always wait a day before making a big purchase and sleep on it. If you come across an expensive item that you want, write up a report about why you want it, how it will impact your life, etc. Act like you are asking your boss to buy an expensive piece of equipment or something. Then file the report away to be reviewed in a weeks time. After the week is up, re-read the report with the mindset that someone else is asking to borrow money for that reason. If it passes this review, then begin to allocate funds from future paychecks toward it, which could take weeks. By the time all is said and done, if you do buy it, you definitely won’t regret it. 3. Don’t invest in penny stocks or cheap cryptocurrency. They are cheap for a reason and can lose value at any time for no reason. 4. Look at a compound interest tables. Think of it as giving your future self money at a huge discount. 5. Cook your own meals, don’t eat out. 6. Couponing. Clipping coupons works and the savings add up. Just $5 saved a week is $260 a year in extra money. 7. Recycle beer bottles and other cans. If you recycle 20 cans a week that is $1 a week in extra none or $52 a year extra. 8. This is a little risky but try buying limited edition products (games, consoles) and sell when they are sold out. Some fans are hell set on products and will pay a lot for them. Just watch out for the next beanie babies. 9. Print double-sided. Easy way to make your paper last twice as long. 10. Use recycled paper for scrap. When you are done with a sheet save it to write notes on — no need to do anything else. 11. Use old newspapers/ads for food waste (bones, inedible foods). 12. Use three toilet paper tiles and fold it in half to get thickness of six tiles. It feels just like Charmin. 14. Go to random public events for free pens, post-it notes, and candy. 15. Always check payphones, vending machines (and surrounding area) for left over coins. 16. Use shopping bags as garbage bags. 17. Seal windows with tape or something to prevent heat loss in the winter time. 20. Use credit card with cash-back option and don’t use debit for purchasing. Most cash back programs give you 1% at least back a year plus you are building your credit score. 21. Disassemble old hard drives and take out the magnets for whatever. 22. Exercise without getting gym memberships. Running is great here and you can do it for most of the year. 23. Cancel cable and watch your shows online for free. 24. Cut phone service and get VoIP, find independent service providers and not the mainstream providers. 25. Use your old toothbrushes to scrubbing stuff. 26. Water down juices to get a little more to drink (90% juice, 10% water). Same taste and you save yourself 10% a year. 27. Do your own taxes. Turbotax or similar online programs are only $30 a year and take minimal time to do. 28. Take office supplies from work/school. 29. Ask for bandages/gauze at the doctors. 30. Replace all incandescent light bulbs with CFLs. 32. Register all your products, games, electronics, etc. They usually send you promotions for sales, or extended warranty. 33. Sign up for demos and free trails, they might give you a gift on the side, and you can send back the product without the gift. For any of these use a fake email address so they don’t spam your main account. 34. Register for memberships that ask for your birthday, they usually give you free stuff on your birthday, like bagels, coffee, popcorn, etc. Some restaurants let you eat free if you eat with a group of people, just need to show ID. Again always use a fake email address. 35. If you have a kid and need something to do bring them to McDonald’s and ask for the treat of the week. It’s usually cookies or a ruler. If you can, get yourself napkins and salt/pepper/vinegar/ketchup/mayonnaise packages while there. 36. Use the free Wifi at Starbucks and other restaurants if you don’t have internet at home. 37. Buy the generic “no name brand” alternative where possible, including medicine. 38. Keep all receipts for tax purposes, or for surveys that can win you prizes or a discount the next time you visit. Both Dunkin Doughnuts and McDonalds have surveys on most of their receipts which give you free food as a return. 39. If you have “dead” batteries, you can probably use them to power a clock for at least a week. Throw “dead” batteries in the freezer for a few hours, they might work for another hour or so. 40. Save power by setting computer to Power Saving mode instead of Balanced/High Performance, set screen to power off after 5 minutes or whatever, set hard drive to sleep after 5 minutes or whatever, turn down monitor brightness as much as you can. This probably won’t help much but depending on your setup could save you a couple of dollars a month and prolong your monitors life. 41. Borrow books from libraries or view them on Google Books (or download them somewhere), read books at your local bookstore and leave without buying it, and of course don’t buy bookmarks, use something like a receipt or something. 42. Shop at early morning or late at night to save time waiting in line or avoid crowds. 43. Hand wash your clothes and air-dry them. This will save you money and lower your electricity bill. 44. Never borrow money to buy something. If you want something save up to buy it first. 45. Never buy junk food. It is bad for health, has no nutritional value, and is often over priced especially if brand name. 46. Save as much as you can. And you can always save more. Go ahead right now and up your 401k contribution by another percentage point. You won’t even notice the difference in your paycheck but you will see the growth in your retirement account. Check out the graphic below with six of the best money saving tips from Warren Buffett. 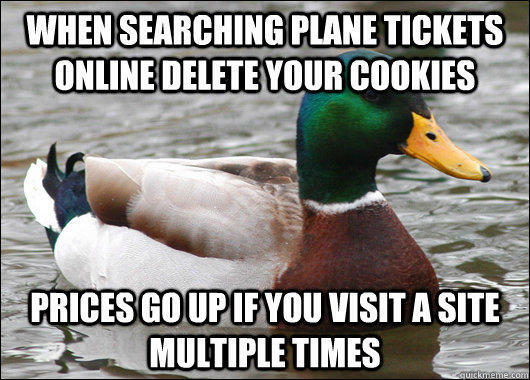 When searching plane tickets online delete your cookies. Prices go up if you visit a site multiple times. Old quarters such as those made prior to 1965 are actually made of silver and as such have a value of the price of silver not the $.25 that the coin is really worth. 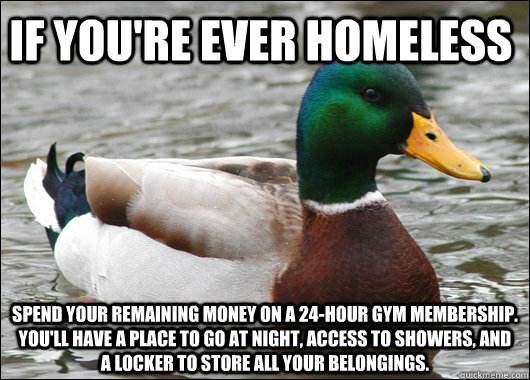 If you’re ever homeless spend your remaining money on a 24-hour gym membership. You’ll have a place to go at night, access to showers, and a locker to store all your belongings. Of course no one ever wants to be homeless or be in that situation but having a gym to go to is a great way to stay in shape and stay clean cut while you look for a new job and get back on your feet. Gyms are clean places with showers, free water, sometimes snacks, and if you can find it even often open twenty four hours a day.